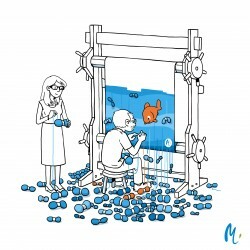 The French Meli Melo* website uses movies, artwork, drawings and images to help the community understand issues and challenges related to water management. The site covers a huge spectrum of water issues and demonstrates that while the issues are serious and complex, it is still possible to live both comfortably and in harmony with natural systems. The messages on the site are universally relevant to urban design and environmental protection. Meli Melo passionately promotes free use and reproduction of their materials (movies, artwork, drawing, ideas and images). The site is a creation of The GRAIE Association, a non-profit French research and capacity building organisation focused on water management and urban planning. The GRAIE Association’s goal is to mobilise and bring together those involved in water management and urban planning, to help communicate the information and research results in this field on legal, methodological and technical issues, and to promote the evolution of practice by information and training of practitioners. While the bulk of Meli Melo’s resources are in French a small number of the mini movies have been given English subtitles and posted on You-tube. We invite you to use and share these mini movies to communicate messages of water sensitive urban design and care of waterways. * Meli-Melo: Demelons les fils de l'eau roughly translates as Let us unravel the story of water.